Dragon’s Crown Soundtrack On iTunes! Hey, everyone! A PSA for all of you Dragon’s Crown fans out there, or really anyone that just loves fantastic video game soundtracks. The OST to the amazing side scrolling fantasy themed loot questing brawler from 2013 on PlayStation 3 and PlayStation Vita is now available on iTunes! This glorious compilation spans 58 tracks, the entirety of all the music the game has to offer, including a couple of piano arrangements. Of particular note is the haunting melody known as ‘World Map’, which is already an incredible track and an instant classic that all but defines the Dragon’s Crown experience. Not only is the music thematically perfect in setting an ominous tone of dangers to come from your next destination, but the vocals are as enchanting as anything you’re likely to hear in any musical composition out there. Take a listen. And just for comparison’s sake, here is the piano rendition of the same track. A truly beautiful interpretation. The music was composed by the talented Hitoshi Sakimoto (Final Fantasy Tactics, Vagrant Story, Tactics Ogre: Let Us Cling Together), and he’s done some of his finest work here. I imported a physical copy of the Japanese release because I love this soundtrack and Dragon’s Crown in general, but you don’t have to do that if you’re just looking for the music, which can now be purchased on the iTunes store in its entirety for $29.99. 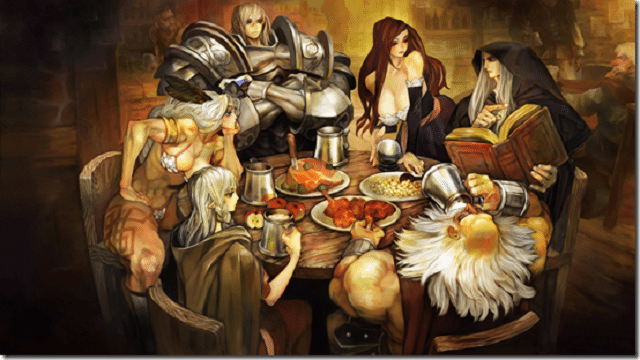 Dragon’s Crown is available for the Sony PlayStation 3 and PlayStation Vita, and now the soundtrack is available on iTunes.